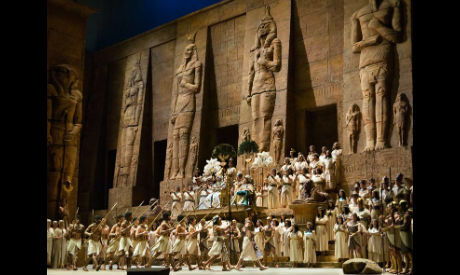 An upcoming live transmission from New York’s Metropolitan Opera will present Aida by Italian composer Giuseppe Verdi, to libretto by Antonio Ghislanzoni, on Saturday, 6 October. The transmission will also reach Egypt with screenings at the Cairo Opera House, Malak Gabr Arts Theatre at AUC, the Bibliotheca Alexandrina in Alexandria and the Technical University of Berlin in El-Gouna, at 7pm. The Metropolitan Opera described the Aida production as "what should be a highlight of the new season." Verdi's iconic work will feature the internationally renowned soprano Anna Netrebko in the title role. It is the singer's first appearance as Aida with the New York opera house. The cast will also include mezzo-soprano Anita Rachvelishvili as Amneris, tenor Aleksandrs Antonenko as Radamès, and baritone Quinn Kelsey as Amonasro. Nicola Luisotti will take the podium. Aida is based on a story written by French Egyptologist Auguste Mariette, commissioned by the Khedive Ismail Pasha. It was first performed at the Khedival Opera House in Cairo on 24 December 1871. Aida has special thematic and historic significance in Egyptian culture and is one of the most popular operatic works performed in Egypt. Aida is also among Verdi's most known works, staged worldwide by opera companies. The Metropolitan's initiative of worldwide live screenings was launched in December 2006 and became very popular, gaining a total of around one million viewers worldwide in its second season. Today, over 70 countries across six continents – with over 2,000 screens, including 750 in the US – have joined the network. In October 2010, Egypt introduced live HD transmissions of the Met Opera at the Red Sea resort of El-Gouna and the Cairo Opera House. In October 2015, the Bibliotheca Alexandrina joined the network for international screenings. The licence for the Met’s transmissions in Egypt is generously supported by the Sawiris Foundation for Social Development and the Mahmoud Abdalla Foundation.